We hope that the graph below will give you an indication of our most recent success rates for IVF & ICSI. Proportion of IVF and ICSI in 2018 was 50 : 50. We also aim to perform your embryo transfer on day 5, when your embryos reach the blastocyst stage in situations when we feel that this will increase your chances. Over 2018, 59% of our patients have had blastocyst transfer and 41% had embryo transfer on day 3. The clinical pregnancy rates from all are shown in the graph below, they are broken down to different age groups. We closely monitor outcomes and advise you on the number of embryos to have transferred in order to maximise your chances of a healthy singleton pregnancy. This often results in surplus embryo following your treatment. If these embryos are of a good grade it is recommended that you freeze them for potential use in the future. During the 12 months we have shown data for, more than 45% of patients completing IVF / ICSI treatment had spare embryos to freeze. 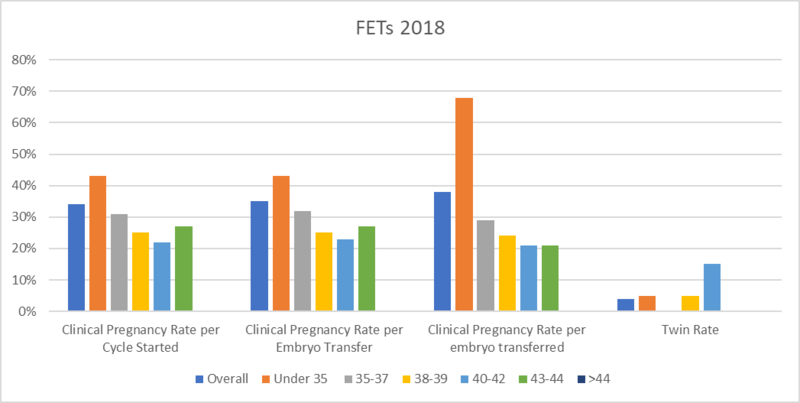 The table below shows the chances of a clinical pregnancy following frozen embryo replacement cycles (FETs). Our IUI pregnancy data have increased considerably with almost double the clinical pregnancy rates compared with data from 2017. The number of patients undergoing IUI treatment is significantly lower than those undergoing IVF/ICSI so there is no age breakdown. In addition to clinical pregnancy rates it remains important to look at patients’ overall chance of taking home a baby. This latest data is available on the HFEA’s website showing our outcomes to be largely consistent with the national average. Also, it is important to point out that using the type of information presented here to make comparisons between centres and choosing where to seek treatment is of limited value. Each patient has individual and sometimes very different requirements and reasons for seeking fertility treatment. Please do not hesitate to contact us should you require more detailed information about your individual chances of success at King’s. If you would like to see more of our data which have been verified by the Human Fertilisation and Embryology Authority then please visit the ‘Choose a Fertility Clinic’ section of HFEA’s website at www.hfea.gov.uk. You can find our clinic data by searching on our name (King’s Fertility), or clinic reference number (0109). King’s Fertility is aware of the General Data Protection Regulation and changes to data protection legislation. This is one of a number of legislative requirements that we must adhere to and as part of the service that you receive from us these requirements are built into our systems and processes. As an organisation, we are not a public body or wholly owned by a public body. Kings Fertility Limited is not subject to the Freedom of Information Act 2000. Where we undertake work on behalf of the NHS, if we receive any requests of this nature, we will refer you to the appropriate public body.